I love me some Felicia Leatherwood and know I can reach out to her with any hair questions. 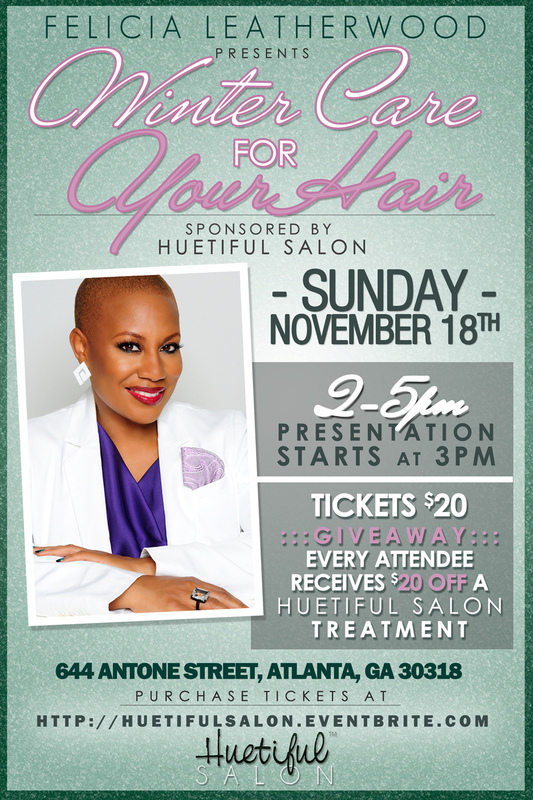 Felicia has hooked up with Huetiful Salon to present “Winter Care For Your Hair” symposium at the new salon in ATL. If you have ever talked to or have been to a Felicia Leatherwood event, you won’t want to miss out on this. Yes, I know alot of us look to bloggers for hair inspiration, but I always say to talk to the PROFESSIONALS who are actually trained in hair care. She, in particular, has a love for natural hair and is very passionate! If you ever had this question, “How do I protect and adjust my hair care regimen during the colder months?”, then this is for you. Get your tickets ASAP! Tickets are $20 and you get a $20 Off coupon to the Huetiful Salon so it basically pays for itself!